Jews Against Islamophobia | Jews Say No: Not In Our Name! In the wake of the heartbreaking, horrifying violence against Muslims worshiping in Christchurch, New Zealand, we must continue–with all the strength we have–to join with Muslim and all communities to challenge and resist anti-Muslim racism, white supremacy, and hate in the streets, in mosques, in domestic and foreign policies, in all spheres of our societies. To our Muslim friends and partners in the struggle for a just world, we are with you. Jews Against Anti-Muslim Racism and Jews Say No! Read the Defund Islamophobia report here. 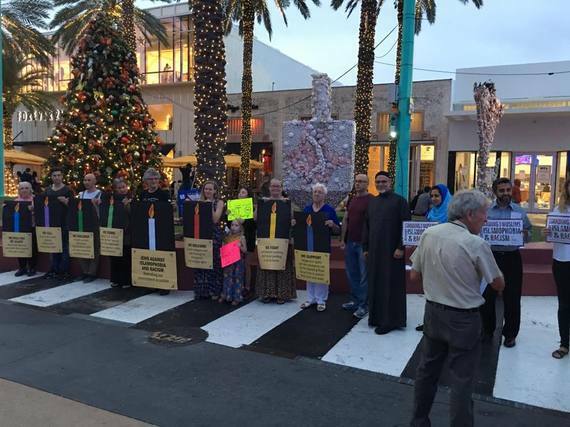 On Wednesday evening, Dec. 21st, in 25 cities across the United States, Jews, Muslims, and other communities joined together to say with clarity and strength: No to Islamophobia; No to Racism: Yes to Justice; Yes to Dignity for All Communities. Organized to coincide with the holiday of Chanukah, which begins Saturday evening, Jewish Voice for Peace (JVP) and its Network Against Islamophobia (NAI), together with JVP chapters and partners, initiated the actions to reignite their commitment to challenging all forms of Islamophobia and racism. • We condemn state surveillance of the Muslim, Arab, and South Asian communities. • We fight anti-Muslim profiling and racial profiling in all their forms. • We challenge, through our words and actions, institutionalized racism and state-sanctioned anti-Black violence. In Kingston, New York, participants braved the cold to join the action called for by the newly created Hudson Valley JVP chapter. In Sacramento, hundreds of people stood together for a creative program ending with a question from the organizers, “How will you follow through on your commitments?”—and suggestions of opportunities, educational events and actions. In Austin and New Haven, in Ithaca, Portland, and Raleigh—and in cities large and small— community members held their candles, visibly and with conviction. In Chicago, the local JVP chapter partnered with American Muslims for Palestine (AMP), the Council on American-Islamic Relations (CAIR) and other groups to call upon Governor Bruce Rauner to reverse his position of pausing the relocation of Syrian refugees and, instead, to welcome and support their resettlement with all the resources at his disposal. A vibrant march co-organized by JVP Boston made its way through the streets of downtown Boston. Hundreds of people participated, and the large group of social justice groups* that cosponsored the event expressed a commitment to addressing a wide range of issues. And in Miami Beach, where I live, CAIR FL and JVP joined to create an event that brought many communities together. In addition to music and readings, a number of children read signs they had made with words of “compassion,” “justice,” “respect,” “equality,” and “a world without Trump,” in response to being asked what words came to mind when they thought of the world they wanted to live in. The Chanukah actions are part of a broader commitment to engage in this work thoughtfully and consistently and to stand against all forms of Islamophobia—whether it is a hate crime in the street or violence resulting from US domestic or foreign policies. JVP’s Network Against Islamophobia has as its foundational principles being accountable partners in the larger movement led by Muslims and those who have been directly impacted by Islamophobia and anti-Arab racism, and, at the same time, doing the work within Jewish communities to bring these issues to the forefront. That also means engaging within our communities in learning together through workshops and discussions about the multiple ways in which Islamophobia is manifested and how we can do this work most meaningfully and effectively. Muslim communities and other impacted groups have been organizing for a very long time. The very positive recent decision by President Obama to dismantle the regulations that enable the NSEERS (Special Registrations) program to exist grows out of years and years of organizing by groups like DRUM (Desis Rising Up and Moving) in NYC and by other groups that have been directly targeted by these government policies and programs. As that organizing continues to grow, JVP and NAI hope to be genuine partners in this work. Community-building was also a key part of Wednesday’s actions, something that is much needed at this time. Participants made their commitments, not just for the evening, but as part of long-term, sustained, collaborative work for justice. *The cosponsors of Boston’s actions included American Friends Service Committee, Northeast Palestine Advocacy Project, Boston Coalition for Palestinian Rights, 1for3.org, Common Street Spiritual Center, Muslim Justice League, Arlington Street Church/Boston – Social Action Committee, UU’s for Justice in the Middle East – MA Chapter, Cambridge Bethlehem People to People Project, Black Lives Matter Cambridge and JETPAC Inc.
Islamophobia didn’t start with Donald Trump. Yes, his words have been disturbing and dangerous. But the problem of Islamophobia is already so deeply embedded in our public discourse and our domestic and foreign policy that Trump’s words shouldn’t have surprised us. Though Islamophobia has a long and ugly history, for many of us outside the Muslim community, the aftermath of 9/11 was when we first became aware of it. The many manifestations and layers of Islamophobia came into my consciousness in a real way as a result of my involvement several years ago with a coalition in support of the Khali Gibran International Academy, an Arabic dual-language public school, and its founding principal, Debbie Almontaser, who lost her position because of a sustained anti-Muslim, anti-Arab campaign against her and the school. While she was targeted by a group of Islamophobes who wanted to shut down the school and who, as part of their propaganda, claimed it would be a training ground for terrorists, the real damage was done by the mayor of NYC and the Department of Education, government institutions that capitulated to the Islamophobes who demanded the principal’s resignation. There is a very carefully orchestrated anti-Muslim propaganda campaign that seeks to equate Islam and Muslims with violence. As we seek to resist this propaganda, we also have to examine the ways in which we can end up perpetuating it. The conflation of violence with Islam and with Muslims is so all-encompassing that many of us can easily get trapped in a narrative that is rooted in Islamophobic assumptions and propaganda. Religious scholars can provide evidence until they are blue in the face that every religion preaches both violence and peace and that every religion has those committing acts of violence in its name. But we don’t hear media and political leaders demonizing Christianity or Judaism, just to name two religions whose members have committed extreme acts of violence in the name of their religion. Our discussions of violence must necessarily address the massive levels of violence perpetrated by the U.S. government. The U.S. has wreaked havoc on, and continues to do irreparable damage to, countries and societies and peoples across the globe. If we want to have conversations about violence, this is where I would begin. Many discussions of violence are too often rooted in Islamophobic assumptions about whose violence needs to be “explained.” This framing too often ignores the larger truth about the extent of violence being carried out globally by the U.S. government and its allies. Islamophobic hate speech and acts of violence take place in the context of the ongoing, state-sponsored Islamophobia of the U.S. government, whose foreign policy invokes Islamophobia to rally support for its bombing of countries with large Muslim populations. Human rights lawyer and activist Bina Ahmad has written: “Islamophobia necessitates convincing people that there’s a war at home and abroad”—and that this messaging “pushes through a brutal agenda and also allows our government to mask its true agenda.” It is not only right-wingers and Republicans, and the Trumps of the world who propagate Islamophobia, but also Democrats and along with them, the liberal establishment. Those supporting the U.S. war on Muslims abroad intentionally amplify Islamophobia at home. As a result, the dominant narrative focuses on the violence of Muslims, rather than on the pervasive violence of imperialism and occupation. This is also reflected in the ways the Israeli government uses the “clash of civilizations” framing to paint itself as a democratic, civilized island in a sea of violent Muslims, and thereby to justify its militarism and its oppression of Palestinians. It is no surprise that the same network of donors that sustains unconditional, hawkish support for Israel also funds Islamophobia in the United States. Those most impacted by Islamophobia, including the frightening levels of Islamophobic hate speech and violence all around us at this moment, are challenging it on many fronts. There is enormous organizing going on within Muslim communities and among other targeted communities. I hope that those of us organizing in the Jewish community can continue to be intentional in our work, and as we organize, make sure that we are not perpetuating the structures of oppression we claim to, and genuinely want to, resist. This piece was adapted from a presentation the author made on “Challenging Islamophobia” as part of a panel at a Jewish Voice for Peace national membership meeting in March 2015. Donna Nevel is a community psychologist and educator. Click here to listen to audio (Flash required). Members of Jewish Voice for Peace and Jews Say No, gathered under the umbrella of Jews Against Islamophobia. They stood at Rockefeller Center Sunday night in the shape of a menorah, with nine signs representing each of the Chanukah candles, each symbolizing an injustice. They rekindled the commitment to speak out against all forms of hate speech and violence directed at the Muslim community or those perceived to be Muslim. Please click on the arrow at the WBAI link to hear our report. This Hanukkah, Jews across the U.S. are taking to the street to rally against the Islamophobia and racism rampant in their communities. On each night in the eight-day-long religious holiday, Jewish activists are participating in protests against various forms of injustice in a campaign initiated by the Network Against Islamophobia, a project called for by national peace organization Jewish Voice for Peace (JVP) to challenge anti-Muslim bigotry, along with Jews Against Islamophobia, a coalition of JVP-New York and the activist group Jews Say No! The demonstrations are being held in 15 cities throughout the country, including Chicago, Boston, Miami, Seattle, Atlanta. The first demonstration was held at New York City’s Rockefeller Center on Sunday, Dec. 6, the first night of Hanukkah. We welcome Syrian refugees and stand strong for immigrants’ rights and refugee rights. December 6, 2015 — This week, American Jews are participating in a series of nationally coordinated actions against Islamophobia and racism to mark the eight days of Chanukah with a rekindling of their commitment to justice. Beginning Sunday, December 6th at 4pm in Rockefeller Center in New York City, each night of Chanukah Jewish activists and community members will gather to make public commitments to challenge state-sanctioned Islamophobia and racism and to call for the United States to welcome refugees. Each of the commitments is articulated through a sign that is in the shape of a candle; the candles together are in the shape of a menorah. Actions are happening each night in 15 cities across the country—New York City, Miami, Chicago, Washington, DC, New Haven, Portland (Oregon), Durham, Columbus (Ohio), Seattle, Atlanta, Boston, Ithaca, Springfield, Denver and Providence. Initiated by Jews Against Islamophobia (JAI) in NYC (a coalition of Jews Say No! and Jewish Voice for Peace–New York) and the Network Against Islamophobia (NAI), a project of Jewish Voice for Peace nationally, these actions call for the Jewish community to stand strong against Islamophobia and racism and in solidarity with communities facing threats and discrimination in the wake of recent violence and disturbing public rhetoric. On the eighth and last night of Chanukah, activists in each of the cities will come out again to rekindle their commitments to justice from city to city, from community to community, and from strength to strength. The commitments listed on the signs are: 1. We will not be silent about anti-Muslim and racist hate speech and hate crimes; 2. We condemn state surveillance of the Muslim, Arab, and South Asian communities; 3. We challenge, through our words and actions, institutionalized racism and state-sanctioned anti-Black violence; 4. We protest the use of Islamophobia and anti-Arab racism to justify Israel’s repressive policies against Palestinians; 5. We fight anti-Muslim profiling and racial profiling in all its forms; 6. We call for an end to racist policing #SayHerName #BlackLivesMatter; 7. We stand against U.S. policies driven by the “war on terror” that demonize Islam and devalue, target, and kill Muslims; and 8. We welcome Syrian refugees and stand strong for immigrants’ rights and refugee rights. Follow @jvplive and #Light4Justice to see photos and videos of the actions this week. Thoughts after the Paris attacks – Raymond Wofsy, member of Jews Say No! educator/activist living in Paris. Jews Against Islamophobia, a coalition of Jews Say No! (jewssayno@gmail.com) and Jewish Voice for Peace-NY (jvp-nyc-coordinating@googlegroups.com), would like to share the thoughts of Raymond Wofsy, member of Jews Say No! and educator/activist who is living in Paris. the people who were killed and who are still in the hospital. proximity, and friends of friends are in the hospital or were killed. and that I could easily have been at or near on Friday. that feels right to me. France is already participating in, specifically by bombing Syria. millions of people who live with this type of fear everyday. Islamophobic backlash, which has already started. Posted in Published online | Comments Off on Thoughts after the Paris attacks – Raymond Wofsy, member of Jews Say No! educator/activist living in Paris. Nov. 2, 2015 Jews Against Islamophobia (JAI) and Jews for Racial and Economic Justice (JFREJ) are outraged to learn that the NYPD has continued to spy on the Muslim community and calls on the Mayor and City to put a halt to this discriminatory practice immediately. Despite Mayor De Blasio’s statement when he took office that it is unfair for law enforcement to single out people on the basis of their religion, the Gothamist reported that an undercover NYPD officer had been spying on a group of Muslim students at Brooklyn College as late as December 2014, eight months after he took office. Pretending to have converted to Islam, the undercover NYPD officer spied for four years on women from the Brooklyn College Islamic Society solely because they are Muslim. Such surveillance undermines civil liberties and injures the people and community being targeted. In 2011/2012, a Pulitzer Prize-winning Associated Press series documented that the NYPD had engaged in a far-reaching surveillance program that burrowed deep into the lives and institutions of New York-area Muslim communities. Informants were placed in mosques, Muslim student organizations, and Muslim-owned bookstores, businesses, and cafes. Some infiltrated Muslim student groups on college campuses at six branches of the City University of New York, as well as at colleges outside the City. As Alan Levine, civil rights lawyer and member of JAI, wrote in a 2012 piece in the National Law Journal on NYPD’s Unconstitutional Surveillance, “The Muslim community should not have to wait a day longer for city officials to abandon a practice that so flagrantly affronts principles of equal justice and religious freedom.” This remains equally true in 2015 and must stop immediately. 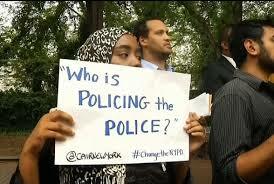 The JCRC fully supported former Police Commissioner Ray Kelly’s anti-Muslim policies. In February 2012, when a dozen of the Pulitzer Prize-winning Associated Press (AP) articles on the NYPD surveillance of the Muslim community had already been published, the JCRC’s president, executive vice president and CEO, and associate executive director published an article in The Jewish Week making “The Case for Ray Kelly.” As a published response to this opinion piece pointed out: (1) the JCRC leadership’s expressed concern for the safety of New Yorkers did not extend to the Muslim community; (2) JCRC leaders “trivialized the impact of constant surveillance upon the Muslim community”; and (3) the JCRC statement did “not acknowledge that Ray Kelly was a featured interviewee in ‘The Third Jihad,’ a rabidly Islamophobic film — a fact he conveniently ‘forgot.’ Under Kelly’s watch, according to files uncovered by NYU’s Brennan Center for Justice, the NYPD showed nearly 1,500 police officers during their training this anti-Islam propaganda film whose main narrative is that Muslims are trying to violently ‘infiltrate and dominate America.’ Though the JCRC claims part of its mission is to “build bridges to, and work with, many leaders in New York’s Muslim communities,” during this massive assault on the city’s Muslim, Arab, and South Asian communities, the JCRC wasn’t just silent, which would have been bad enough—but its top leadership spoke in strong support of the person in charge of this Islamophobic campaign. Long-time Member of the JCRC Board of Directors Who Has Worked with Pamela Geller and Other Leading Islamophobes Additionally, Jeffrey Wiesenfeld, a member of the JCRC’s Board of Directors, was a leading figure in the 2007 attacks on Debbie Almontaser, founding principal of the Khalil Gibran International Academy (KGIA), planned as the country’s first English-Arabic dual language public school. Wiesenfeld was New York chair of Stop the Madrassa, a self-described “community coalition” that formed in June 2007 to prevent KGIA from opening. Another key player in Stop the Madrassa was Pamela Geller, who subsequently spearheaded the opposition to Park51 and spewed anti-Muslim hate across the country’s transit systems; Geller got her start as an activist, not just a blogger, when she joined Stop the Madrassa. Three other central figures in Stop the Madrassa—Frank Gaffney, Daniel Pipes, and David Yerushalmi—are discussed at length in the Center for American Progress’ Fear, Inc.: The Roots of the Islamophobia Network in America. When Wiesenfeld attacked Almontaser and claimed that KGIA was trying to carry out a “soft jihad,” she asked that the JCRC respond to these attacks. But they did nothing and, as Almontaser reports, refused her requests to meet with them. Almontaser was forced to resign in 2007 after public officials, as the Equal Employment Opportunity Commission later determined, “succumbed to the very bias that creation of the school was intended to dispel….” Wiesenfeld remains on the JCRC board.